Day 1c of partypoker LIVE Millions Russia saw 148 players survive, including Philipp Gruissem. 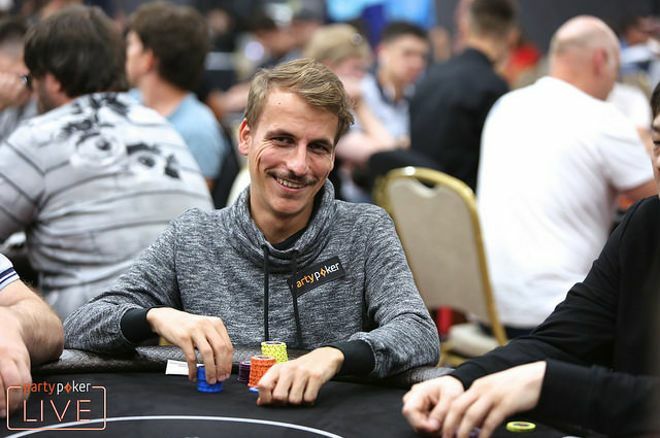 The Sochi Casino and Resort saw a packed poker room today as the final starting flight of the partypoker LIVE MILLIONS Russia Main Event took place with players given the final opportunity to build a stack before the start of Day 2 on Friday, Aug. 10. The entrants total peaked at 270, with 148 of those able to bag their chips at the end of the eight 60-minute levels. Hadi Khordbin finished with the most with a stack worth 5,930,000. Reportedly, Khordbin won the majority of his chips in the final 30 minutes of play after a 5 million pot occurred against Vitaly Pankov, with Khordbin's pocket aces holding against Pankov's pocket kings. Andrey Tkachenko (5,000,000), Igor Yaroshevskyy (4,420,000), Michael Sklenicka (4,405,000) and Igor Ovcharenko (4,370,00) make up the top five stacks, with defending champion Aleksandr Gofman not far behind the leaders on 4,050,000.
partypoker ambassadors Ludovic Geilich, Dzmitry Urbanovich and Philipp Gruissem all tried their luck, but only Gruissem survived until the end and bagged 2,980,000. Niall Farrell, who just missed out on a place in the money spots in the Triton Super High Roller earlier today, immediately jumped into the Main Event after his elimination, but his luck ran the same as he fired two bullets to no avail and will have to enter tomorrow for a third shot at MILLIONS Russia glory. Registration to the Main Event will be open to all players on Day 2 until the end of the second break at approximately 4:30 p.m. local time, with players receiving a 1,000,000 starting stack. PokerNews will be back with live coverage of the partypoker LIVE MILLIONS Russia Main Event Day 2 from noon local time tomorrow, so join us then for all the action!